This dial is of fine manufacture, but nonetheless includes many 'mistakes' such as misplaced letters or words. 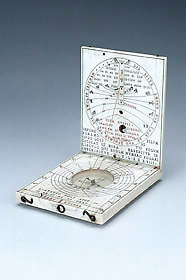 This may mean that ivory's value was such that even imperfect dials were not discarded. It might also indicate the large production of these instruments, since an imperfect example could still be put on the market.